Our lives have been on hold for a couple of months not knowing if we were staying here or going home. With so many factors and complications, it took a lot of consideration and time. Once we finally made the decision to stay here another year, we thought we should take advantage of the kids’ flexible schedule and do spring break a little late to avoid the crowds. With Lynn and I being apart for the next five of eight weeks, we needed some real family time. We looked up the warmest spots in Europe, trying to find beaches and sun, and chose Lagos, Portugal – the most southern tip of Europe. We booked the trip a week before leaving and hardly had a chance to do any research beforehand, besides getting a recommendation on a nice place to stay near the beach. So we went into it blind, hoping we’d like it and set out on the two-hour flight to Faro. I was grateful Lynn was up for renting a car after last time’s disaster. At least they drive on the right side of the road. So we got our little minivan and Lynn refreshed his stick shift skills as we started on the long, winding roads through the Portuguese countryside. Every once in a while, you’d see remnants of a fort or small castle from centuries ago, but most of the drive was very rustic and green. Before we were more than 5 minutes out, Lynn realized the car’s gas tank was virtually empty. I guess they don’t have the same standards of leaving it full for the next guy. So we frantically searched for the nearest gas station and thankfully didn’t have to push our way there, considering how infrequent they were. This gave the boys a chance to see the convenience store offerings of a new country. Tyler found Ketchup flavored potato chips (he can put ketchup on anything) and the others got drinks and unusual candy before we ventured back out. In less than an hour, we found the Belmar Resort and Spa, where we were staying. 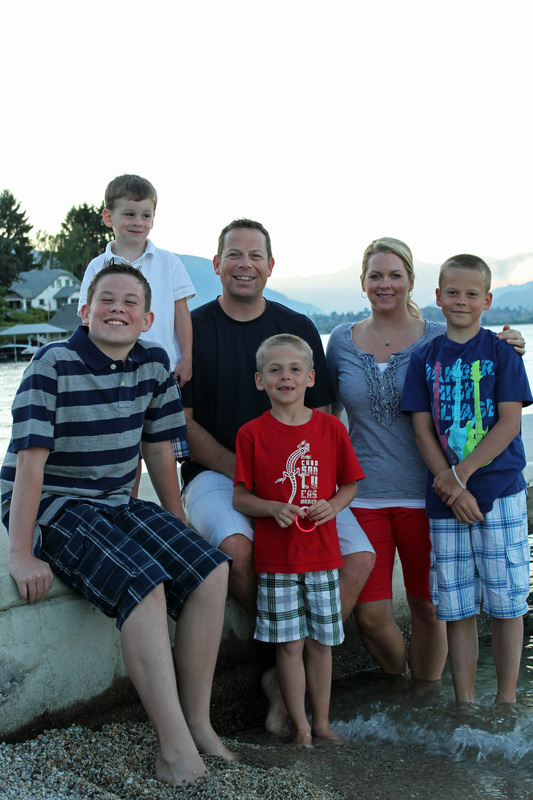 It was perfect for our group – we got a three bedroom apartment with a kitchen, family room and washer/dryer. Everything was new and modern and made life comfortable (except for the extra firm bed!). We were right across the street from the beach and couldn’t wait to head down to check it out. The Porto de Mos beach was so picturesque, it felt like we stepped into a postcard. The warm,perfectly fine white sand between our toes and the crashing waves of turquoise Atlantic ocean set against massive cliffs of interesting red rock was quite a sight to behold. It didn’t matter that the water was freezing and the temperature outside was a bit breezy, the boys were in the water in no time. Being a bit early in the beach season, there weren’t a ton of people at the beach or resort. We walked down to the edge of the beach to see how far it went, exploring in the rocks as we went. Unfortunately, we weren’t able to make it the end because it seemed the further over you went, the less clothing was on. I was annoyed and surprised given it was barely 70 degrees. I was hoping we could avoid that issue coming so early. Thank goodness the little boys were oblivious, can’t say the same for the older ones. Pretty shocking. So we spent the rest of the day swimming, exploring and getting as much sun as possible. The little boys liked the indoor pool best because it was the only warm one. No hot tubs for kids here – given how hot it gets in the summer I can see why. We wore them out and thankfully they all went to bed within minutes and slept for 12 hours. 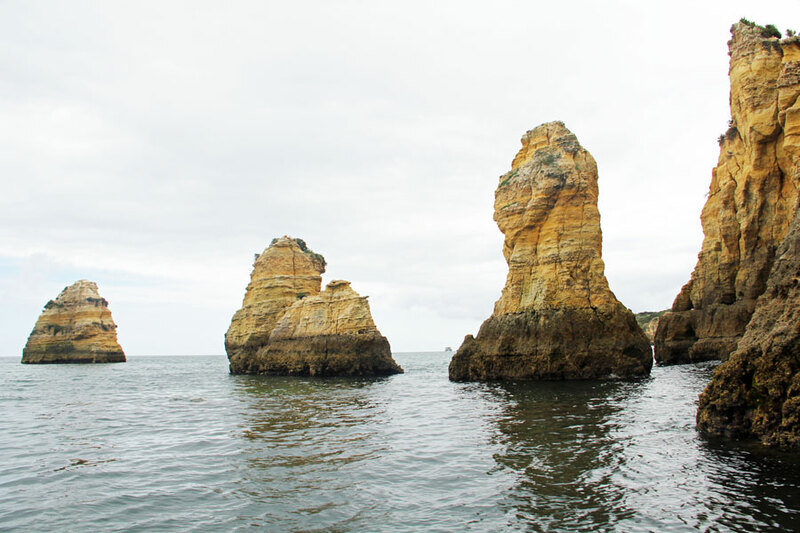 Even though the clouds were rolling in, we wanted to take a tour of the Algarve grottos. It’s a must. We loaded up into the small boat and our driver took us out to see the most incredible rock formations along the coastline. Over thousands of years, the landscape has mysteriously changed, forming stunning caves, and sea arches that we were able to drive through. Our guide pointed out the various shapes the rocks now look like, from elephants, to camels to pirates and cathedrals. We learned of the destructive 9.0 earthquake in 1755, followed by an enormous tsunami that devastated much of this area. The dark lines on the rock was where the water line used to be, but the rocks were shifted up out of the sea. We saw amazing, secluded beaches in between the cliffs and the lighthouse atop Ponta da Piedade. The boys were amazed and entertained as they felt like pirates exploring new territory. It was a wonderful time out together and we were grateful it didn’t rain on us as expected. Since the weather wasn’t wonderful, we spent some time exploring the little city with its ancient walls, churches, cobblestone roadways and little shops. We bumped into the sister missionaries – one was even from Eastern Washington! After gelato, we stopped by a grocery store to stock up on some breakfast and snacks. The fumes of salted fish stacked in heaps around the store about knocked us over. 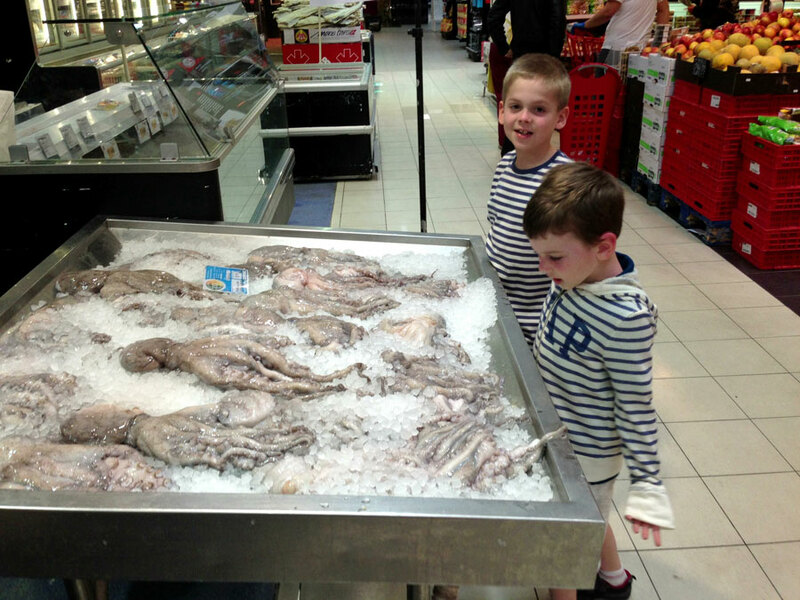 The boys checked out the octopus and I was glad they didn’t try to talk me into trying to cook it up! We had the pool to ourselves for the rest of the afternoon while the older boys hit the waves with Lynn. With the sun out, we all headed to the beach for the older boys to try out their new boogie boards. 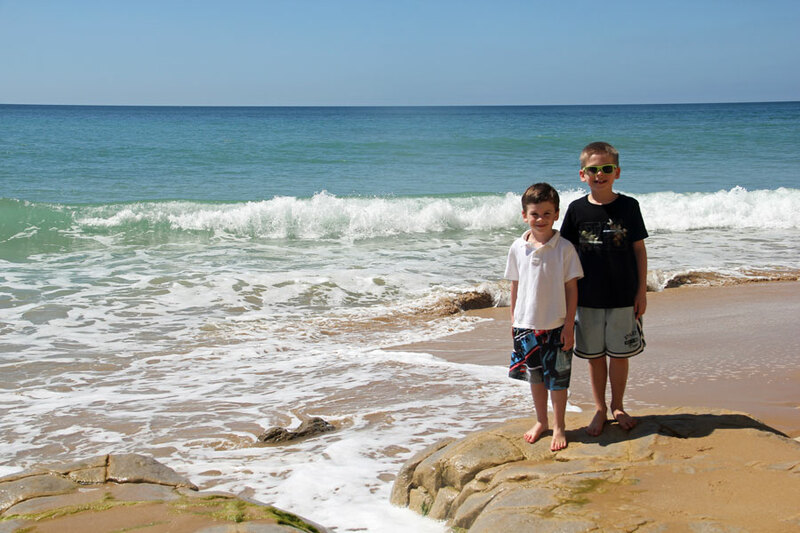 The little boys had fun racing around trying not to let the waves touch them. Jace got a little too daring and had a wave crash on his head, which killed his desire to be at the beach. I took Nathan and him up to the pools to play with their pool noodles and water guns while the older boys stayed to ride the waves. Sadly, Cade injured his foot coming back and hobbled around the rest of our vacation. Poor guy. We went back to the Marina for lunch and were pleasantly surprised at how good the Chinese food was. It’s been a while since we’ve had decent Chinese so everyone was happy. On a whim, we chose to drive down the coastline to the most south-western tip of Europe – to Sagres. Ancient settlers believed it was the “end of the known world” and deemed it a sacred place, and it’s not hard to see why. Henry the Navigator created his school of navigation there in the 15th century and many navigators developed cutting-edge boats and went on to discover new routes to countries and even the country of Brazil itself. We stepped out to the edge of the landscape not knowing how vertical the steep and sharp 170-foot cliff below was. This whole area is an enchanting promontory high above the beauty of the sea below. Scooting back a little, we watched the huge waves crash on shore and just took in the incredible scenery all around. Cape St. Vincent’s lighthouse ahead is one of Europe’s most powerful. To our left was the Fortress of Sagres, a castle from the 15th century that the boys just had to explore. Having changed over many centuries, natural disasters, and restorations, we walked all throughout the wide interior and saw the church, massive wind compass, cannons and defensive towers. 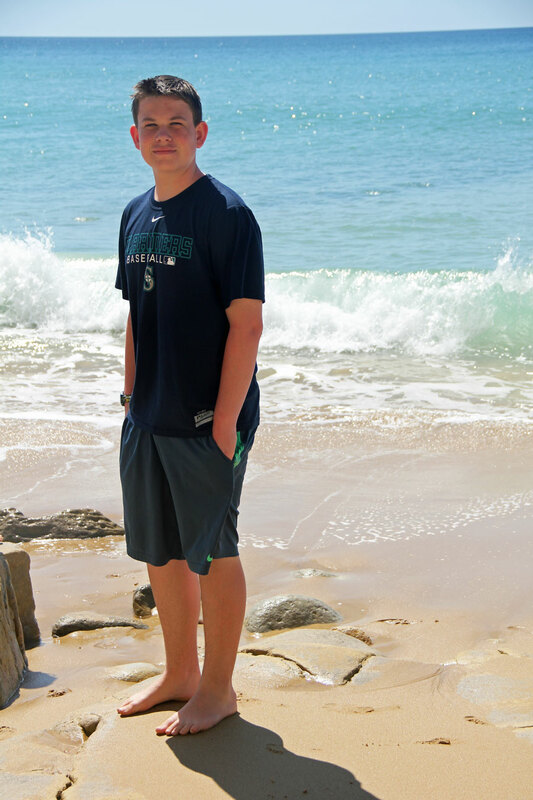 Cade has been studying Spanish and Portuguese explorers this month and the history of those events came alive for him to experience the very settings and places he and Tyler have read about. They all thought it was awesome. We drove back down the coast again and stopped at a remote beach, Praia do Martinhal, and had it all to ourselves. The kids rolled down the sand hills and collected new treasures. We watched a few windsurfers jet with amazing speed across the water near a small island. Back at our beach with warmer temperatures, the little boys lasted a lot longer. They had fun burying Cade in the sand, digging holes and collecting shells. Nathan found a seahorse that washed up on shore and they buried it in a little grave at the base of the rocks. We all swam til we turned into raisins and got cleaned up for dinner. Blue skies and sunshine makes everything prettier! Back at the marina, we boarded another boat to take us on a tour to see the dolphins. We lucked out that we were the only ones on board – our own little private tour. It sped us out to the middle of the ocean and the guide somehow knew right where to find a pod of beautiful dolphins who gave us a show jumping and swimming all around us. The boys were fascinated and so thrilled to see them up this close in their element. We learned all about dolphins and their behaviors. Somehow the boys talked us into the same Chinese restaurant for lunch again and we had gelato for dessert. Sometimes you just stick with what works. We returned back to our beach and were so shocked to see emergency crew and crowds of people. A dolphin, which happened to be the third one of the day, washed ashore and was being whisked away. It was disheartening for the boys to see after our great day out seeing them so lively and happy. It was starting to feel more like summer with hotter temps and we enjoyed playing at the beach. Nathan and Jace entertain themselves. They’re the best of friends. For our final dinner, we wanted to have a true Portuguese dining experience. Lynn found the best little restaurant nearby that had delicious, fresh catches of the day, traditional appetizers of marinated carrot salad, bread with sardine paste (which Nathan was the only fan of – and a big fan that is! 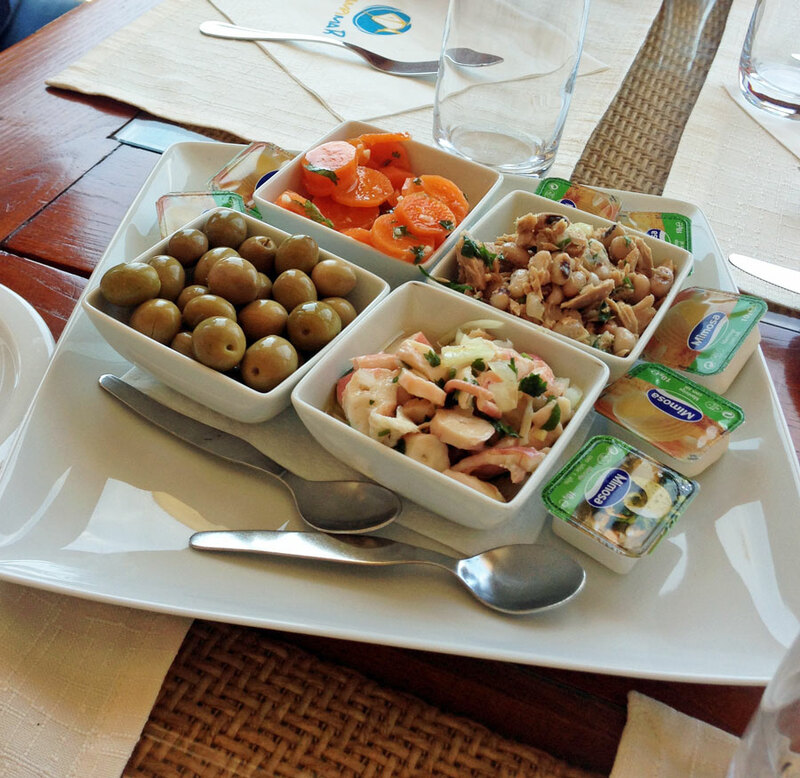 ), olives, and other questionable appetizers we couldn’t figure out. Everyone loved their meal, especially Tyler with his pork tenderloin and clam bake. Best meal he’s ever had he said. We ate by candlelight as we were serenaded with live music from a local talented guy. The whole place lit up with people clapping and singing along, including ourselves. It was a great experience to participate in. No one wanted to leave, but it was our last day. Cade was pretty much out of commission with his foot so the other boys and I walked along the beach to the opposite side and tried to soak up the last few moments we had. The little boys ran along the shore trying to stay dry. Good intentions at least. We had our last meal at the restaurant on the beach with more local fresh fish (stone bass is excellent), pina coladas, sardine paste on bread for Nathan, and the like. Besides Cade’s injury and Tyler’s Nike sandals being stolen at the beach, it was the most wonderful time spent together in the most beautifully stunning place we’ve ever been. We will miss you Portugal.